It’s a milestone seven years in the making: 87 years since the Maud sank near Cambridge Bay, Nunavut, the vessel is finally on its journey home. It's a milestone seven years in the making: 87 years since the Maud sank near Cambridge Bay, Nunavut, the vessel is finally on its journey home. 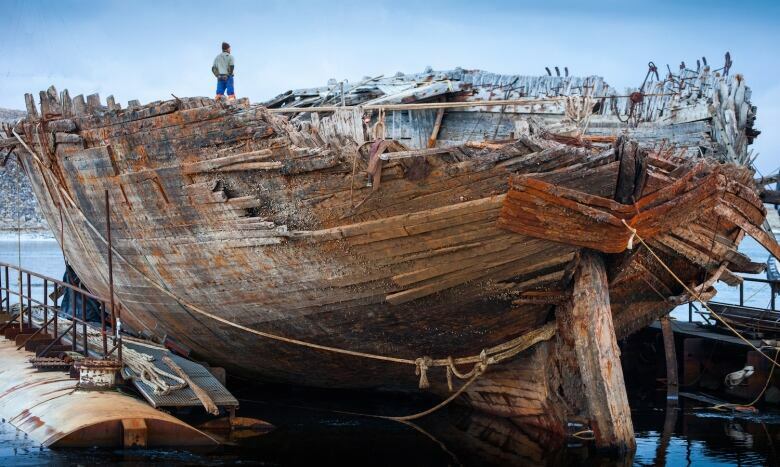 Explorer Roald Amundsen's ship sank in 1930 and sat in shallow coastal waters for decades, until Norwegian Jan Wanggaard and his team with the Maud Returns Home project got involved. 'We are very happy,' says Jan Wanggaard, project manager of Maud Returns Home team. (Kate Kyle/CBC)For years they worked to raise the Maud to the surface, as part of a repatriation effort to bring the well-preserved remains of the vessel back to Norway. On Tuesday, sitting atop a barge, it began its float home. Wanggaard, the project manager, says it's been a long time coming. "I am overwhelmed by all the practicalities you have to deal with before we leave," he said. "Now we are in the middle of departing, and so of course it's a milestone for the whole project so we are very happy." The Maud is heading east, back through the Northwest Passage, and will spend this winter in Greenland before going to its final destination in Norway. Joe Ohokannoak, the deputy mayor of Cambridge Bay, was able to catch one last glimpse of the Maud loaded on its barge as it sailed away. 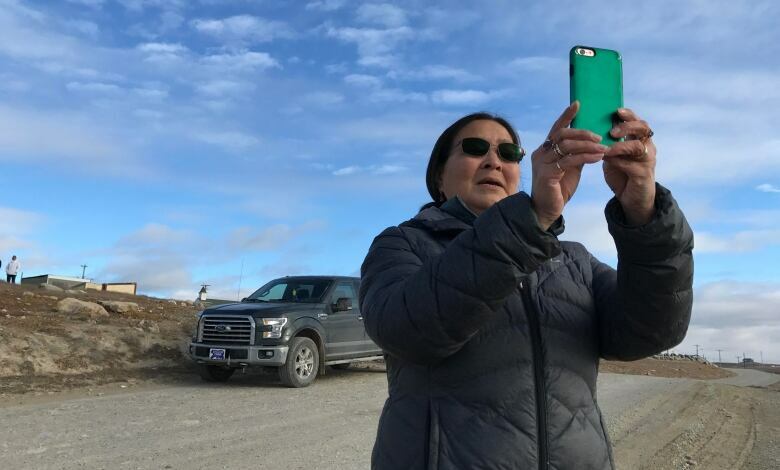 "I went out to the main Northwest Passage along the coast by my cabin and I could see the Maud being towed by the tugboat heading south and then east," Ohokannoak said. Ohokannoak is an amateur historian who enjoys studying Arctic history. "The Maud certainly was part of our history," Ohokannoak said. "It was an attraction for cruise ships coming in, sail boaters, and just regular visitors to Cambridge Bay, especially the last year when it was totally out of the water on pontoons." He said the community had mixed feelings when the idea of taking the Maud back to Norway was first floated, but since then the community has come to see it in a positive light. "After a while people realized, 'Yeah, it was their ship and they had the right to take it back [to Norway], restore it and put it in a museum.'" Ohokannoak said one day, he might visit the Maud again in Norway. The Maud, a wooden ship named for Queen Maud of Norway, was built for Amundsen. He was the first expedition leader to sail the Northwest Passage and the first person to reach the South Pole. It launched in 1917 with the intent to reach the North Pole, but after several unsuccessful attempts, Amundsen was not able to pay his debts and the Maud was seized and sold to the Hudson's Bay Company. It used the ship as a floating trading post for a few years before it eventually sank. Four Norwegians used giant "balloons" to raise the wreck last summer, then slipped a barge under it and let it dry out over the winter. Wanggaard has been hesitant to put a date on Maud's arrival back in Norway, but said it would be great if it coincided with some significant anniversaries, like December 2018, 100 years since she sailed from Norway.